The Legend of King Arthur - Who was King Arthur? How did the Legend of King Arthur Start? A name that is always associated with the Medieval Kings of the Middle Ages is the legendary King Arthur. But if we look at the Medieval Kings Timeline the name of King Arthur does not appear. The timeline is accurate but our knowledge about a ruler of Britain called King Arthur is not. During Medieval times there were documented records about all of the Kings of England from William the Conqueror in 1066 to the end of the Middle Ages in 1485 and the beginning of the Renaissance period. So where does King Arthur fit in? Who was King Arthur? We associate King Arthur with the Knights of the Round Table, with their Code of Chivalry and Courtly Love and with a place called Camelot and a magician called Merlin. If King Arthur was not a king in Medieval Times did King Arthur rule England during the Dark Ages ( 410 AD - 1066 AD )? The name of King Arthur does not appear in records detailing the Dark Ages Kings of England either! It is therefore not possible to provide an accurate biography of the life and history of King Arthur - we can only create a biography from his legend. But the Dark Ages got its name due to the fact that documented records of the era were scarce. Was there a great man who lived in the Dark Ages who gave rise to Legend of King Arthur and the Knights of the Round Table? Legend of King Arthur is not based on real historical evidence, nor can it be verified with hard and fast facts. Legend of King Arthur was based on the books written by the clerics of the Medieval era or the Middles Ages. The stories found in many Welsh legends and Celtic Myths about King Arthur and the Arthurian Legend provide the Welsh people with a claim to the sovereignty of the whole kingdom of Britain. King Arthur is referred to as "the one, true King of the Britons". The romantic legend of King Arthur was fuelled by the Troubadours, jongleurs and Minstrels of the Medieval era. 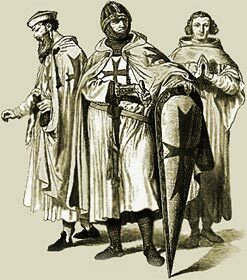 The stories of the valiant King Arthur, great knights, Camelot, chivalrous deeds, great battles and fair ladies were spread from court to court all over Europe by the troubadours. The image of King Arthur and the Knights of the Round Table took on the the clothes and fashion of the Medieval era. Jousting in tournaments were also incorporated. Fiction was again turning into fact. And we now have an answer as to why we associate King Arthur with the Medieval Kings. The Kings of England during the Medieval times turned these myths and legends to their advantage and Fiction was turned into Fact for political purposes. The Arthurian legend and Legend of King Arthur had highly significant influence on the actual history of England and Wales. These legends and myths about King Arthur "the one, true King of the Britons" were used by Kings of England, especially the Tudors, to authenticate their claims to the both the Welsh and English thrones! King Edward I (Longshanks) used these Arthurian legends and myths about King Arthur when he conquered Wales. Connections between Caernarvon, Arthurian Legend, Merlin, Prophecies and even Stonehenge were made in an attempt to give King Edward a 'legitimate claim' to the Welsh throne. The Tudor Kings of England used the same ploy! These Kings of England used the stories from Arthurian Legend and Legend of King Arthur to give them credibility. It was convenient for them to turn the stories and myths about King Arthur and the Arthurian Legend into hard facts! The people of England liked connections to the old Religions and life before the Romans and then the Normans conquered England - The magicians, the wizards and the Druids. Some interesting facts and short biography information about Legend of King Arthur. Additional useful details, facts, history, biography, timeline and information about the lives of all of the Medieval Kings of England and the important events which occurred during their times, can be accessed via the Medieval Life and Times Sitemap. The content of this article on Medieval life and times provides free educational details, facts and information for reference and research for schools, colleges and homework for history courses and history coursework.